The vandals destroyed a Padmavati rangoli which was made in about 48 hours! The Bollywood film Padmavati has been making news since the very beginning. Lately, the film has been in headlines due to the revelation of the first looks of the star cast including Deepika Padukone, Ranveer Singh and Shahid Kapoor. After that, the film created a lot of buzz when the trailer of the film was released. But much before that, it was in news for all the wrong reasons. Everyone knows how difficult it has been for Sanjay Leela Bhansali to work on this project. A Hindu group called Shri Rajput Karni Sena has been against the making of Padmavati since the very beginning. In the past, they have vandalised the sets of the film, burnt assets worth crores, destroyed the posters of the film, and even slapped SLB. They have even threatened the makers to not let the film release. And now, the group has again come up destroying something related to the film. 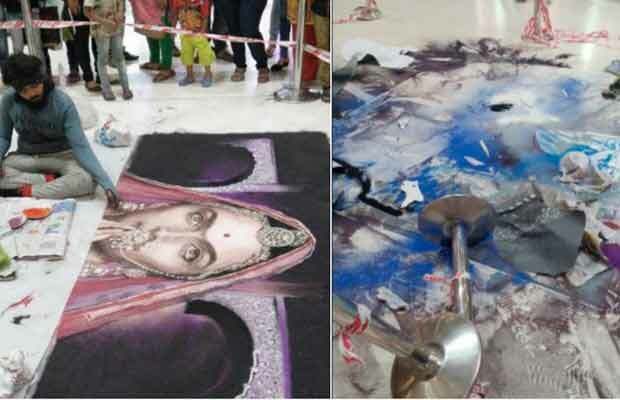 An artist, in Surat, had made a rangoli of Deepika Padukone in the Padmavati look. He took as many as 48 hours to complete the masterpiece. But to the artist’s shock, a few vandals came and destroyed the marvellous art work in a few minutes. Padmavati is a period drama in which Deepika will be seen playing the role of Queen Padmini. While, Shahid will be seen playing her husband Rana Rawal Ratan Singh, Ranveer will portray the role of Alauddin Khilji. The film is slated to release on December 1, this year. Next articleBigg Boss 11: Priyank Sharma And Dhinchak Pooja To Enter The House!